LONG BEACH, Calif. — Private space companies will launch American astronauts into orbit years before NASA is ready to do so on its own again, but the race to be the first commercial space taxi service is still far from won. NASA's next crew-carrying rocket, the heavy-lift Space Launch System, will blast off on its first test flight in 2017 at the earliest, agency officials have said. But a handful of private companies say they're on schedule to begin lofting astronauts by 2015 — or perhaps even earlier. "We believe we'll be ready in three years," said Gwynne Shotwell, president of Space Exploration Technologies Corporation (also known as SpaceX). NASA is happy about the progress SpaceX and other companies seem to be making. The agency is not in competition with these firms, after all; rather, NASA is encouraging them to develop their capabilities, via its Commercial Crew Development (CCDev) program. 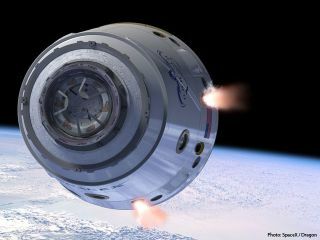 In the last several years, the agency has given money to a handful of firms — including SpaceX, Boeing, Sierra Nevada Corp. and Blue Origin — in two rounds of funding. The goal is to help establish American means of human transportation to space again, an ability the nation has lacked since the retirement of NASA's space shuttle fleet in July. Currently, the United States is completely dependent on Russian Soyuz vehicles to ferry its astronauts to and from the International Space Station. "Obviously, our focus is to close the gap," said Ed Mango, NASA's CCDev program manager. "We want an American-led system in order to get us back into low-Earth orbit, just like we've had for the last 30 years." NASA's Space Launch System (SLS) isn't the answer for low-Earth orbit. The heavy-lift SLS is designed to launch the agency's crew-carrying Orion Multi-Purpose Crew Vehicle toward deep space destinations such as asteroids and Mars. When asked to speculate about when they'd be ready to begin carrying astronauts to the space station, the panelists didn't flinch or hem and haw. Shotwell's estimate of three years before the first manned flight of SpaceX's Dragon capsule was the most aggressive, but her colleagues laid out similar timeframes. Sierra Nevada Corp. chairman Mark Sirangelo, for example, said his company's Dream Chaser — which looks a bit like a miniature space shuttle — should be ready for crew-carrying operations by 2015. Boeing's John Mulholland also marked 2015 for the operational start of that firm's CST-100 vehicle. "In our proposal, with the government funding that we laid out, we believe between 2016 and 2018," Meyerson said. Sierra Nevada, Boeing and Blue Origin have arranged for their craft to fly to space aboard Atlas 5 rockets, which are operated by the American company United Launch Alliance (ULA). SpaceX will launch Dragon aboard its own Falcon 9 rocket. The Atlas 5 should be ready for these launches by 2015 as well, according to ULA officials. "We'll be there whenever they need us," said ULA's Mike Holguin.